I hang up on Dr. Jesson and sigh. “I’m going dairy free,” I announce to NW, who looks up from a steaming saucepan of creamy porridge. “Righto,” he says, and licks the spoon, rather inappropriately. I’m not doing it for the health benefits. NC has been diagnosed as dairy intolerant and NG has, according to her nursery, developed a ‘milk dependency’ – i.e. she won’t drink anything else. I do the obvious thing and put it on twitter: can anyone recommend milk substitutes? The vote is actually quite overwhelming: Oatly. Oatly started in the 1990s when research from Lund university in Sweden led to the company patenting enzyme technology to turn oats into nutritional liquid ‘perfectly designed for humans.’ Since then, the company has really sown its oats (sorry), had a legal battle last year with the milk industry and, two years ago, underwent a massive rebrand courtesy of maverick agency Forsman & Bodenfors whereby the CEO, Toni Petersson, starred in ‘nonchalent’ TV ads. Anyway, to prove they are as nice as their packaging implies, Oatly sends me nearly the entire product range to try and lure me away from the cow. “I want normal milk,” says NG after trying a few sips of the organic variety. “That is the normal one,” I say, not quite lying. She’s not convinced. And, initially, neither am I. Although Oatly doesn’t profess to being ‘just like milk’ in terms of taste, it really isn’t and takes getting used to. BUT. I grow to like it. Oatly, you are like the lovely Saga (Sofia Helin). Difficult to stomach sometimes. But in the end, I do want to have a drink with you. You are like ‘The Bridge’ for my troubled daughter. You do what you think is right. For that, I applaud you … even if I also like milk. Disclaimer: I was provided Oatly samples for this review. I am glad you found a milk alternative as I couldn’t imagine having to go dairy free. What’s the sugar content like on it? Monkey has bad eczema and it has been suggested by family members that we should consider going diary free too – however I don’t think he could do without his blue cheese (he’s obsessed!) Great to hear that the substitutes are not bad though 🙂 and I am sure Monkey would like the chocolate one regardless! 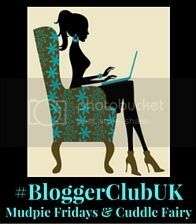 Thank you for joining us at #BloggerClubUK hope to see you aha next week.